James Harden made a little bit of history on Tuesday night – and it’s largely thanks to the 3-point line. 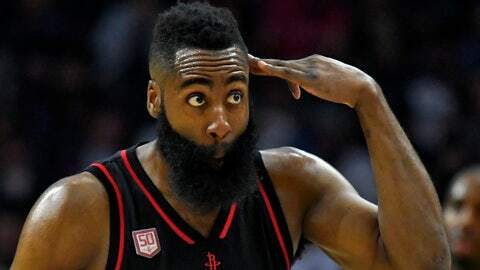 Early in the third quarter of the Rockets’ game against the Golden State Warriors, Harden became the first ever NBA player to both score and assist on 2,000 points in a single season. Although basketball legends Oscar Robertson and Tiny Archibald dished more assists than Harden per season in the ’60s and ’70s, neither assisted on 2,000 points in a given year because they played prior to the adoption of the 3-point line (via Basketball-Reference). Archibald, for example, had 910 assists in 1972-73 – the same year the Kansas City-Omaha Kings point guard became the only player in NBA history to lead the Association in both points and assists. That’s the most assists by any player who also scored 2,000 points in a season, yet those dimes were only good for 1,820 total points (since 910 * 2 = 1,820). Since the NBA instituted the 3-point line in 1979-80, however, only two players have scored 2,000 or more points and dished more than 700 assists in a season: Harden and Russell Westbrook, who has 758 assists this year (via Basketball-Reference). In fact, he’ll likely join Harden in the 2,000/2,000 club before the year is over. Harden got there first, though.